These adorable cabins are an absolute gem in northwest Iceland. Throughout our travels in Iceland, we stayed in an assortment of guesthouses and cottages. I’m really glad that we chose to stay in these wooden huts. Often, we arrived late at night (even though in June, it was still quite light outside) and left early in the morning. Needing only a place to rest our heads and stretch our bodies after lengthy car rides, cozy cottages were a blessing. From Lambhus Cottages in the southeast, with views of rolling meadows and snow-capped mountains, to our peaceful retreat at Ytri-Vik Cottages in the north, Justin and I slept in some memorable Icelandic cabins. Hvammstangi Cottages in the northwestern tiny town of Hvammstangi was no exception. Have you ever visited this town in Iceland? What’s your favorite spot in Iceland? 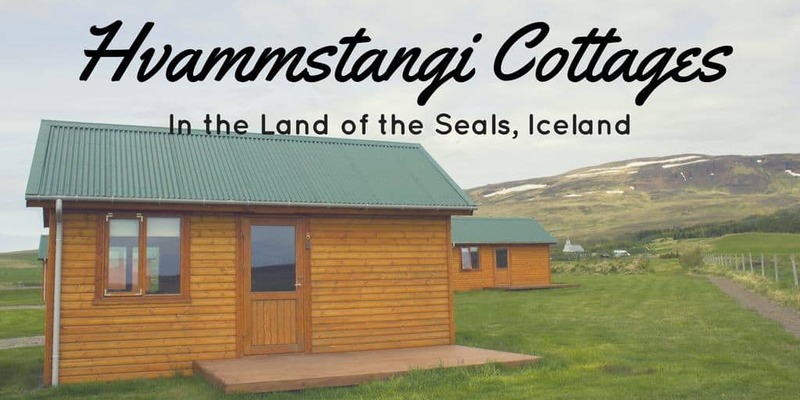 At Hvammstangi Cottages, you’ll find a cluster of several cottages near a small campsite. However, you won’t need to worry about your privacy. While the cottages were all booked up, we rarely saw anyone else. The buildings are staggered and spread out enough that you’ll never feel like crowds of people are around. 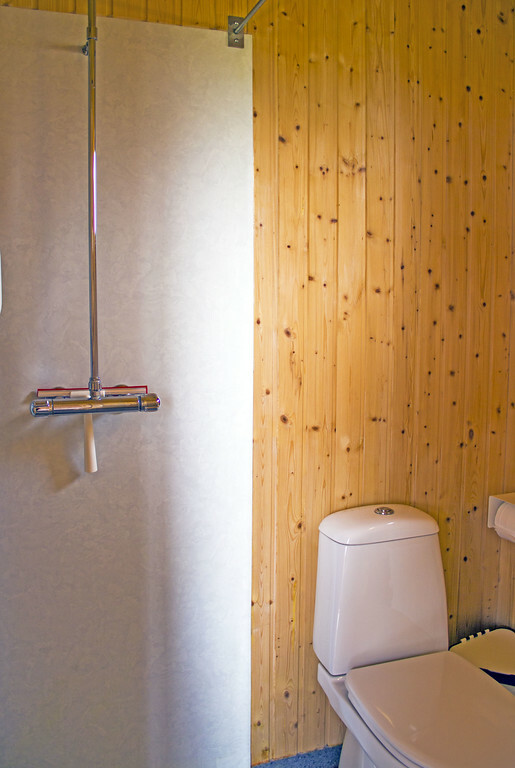 Inside the cabin, you’ll find everything you need for a comfortable overnight stay with additional perks. Justin and I thought it was cute that there was a bunk bed. The most difficult decision of the day was deciding who would sleep on the top or bottom bunk. All bed linens and towels were included in our stay. There was also a couch, a kitchen table with chairs, and a small flatscreen TV. One of the most important factors in booking our accommodations was having access to a kitchenette. We cooked most of our meals as we traveled using ingredients from the grocery store. While these meals weren’t anything too fancy, it saved us a lot of money. Restaurant dishes are expensive in Iceland, and these extra costs could add up over the two weeks we were there. 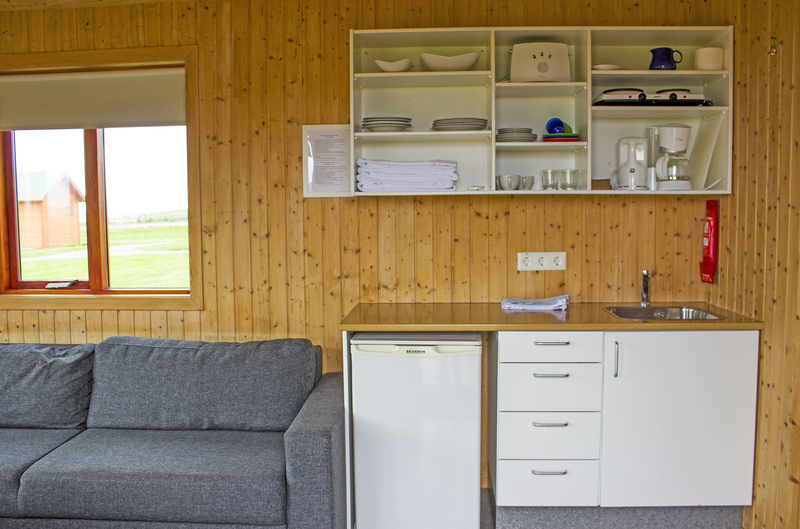 Hvammstangi Cottages had a small fridge, a cooking hob, plates, cutlery, pots and pans, and a coffee maker. The bathroom was small, but had everything we needed: a shower, toilet, and sink. The cabin was equipped with WiFi and heating. Hvammstangi is a small town, about 7km off the Ring Road (main highway of Iceland). There is one main street that runs through Hvammstangi, and the cottages are just a short distance away. Nearly everything is centrally located in this town as it’s such a small place, and it doesn’t take any time to navigate through it. Most famous for seal tours and seal watching, it’s also a great stopover on a tour around the Ring Road. We spent a day in Hvammstangi. 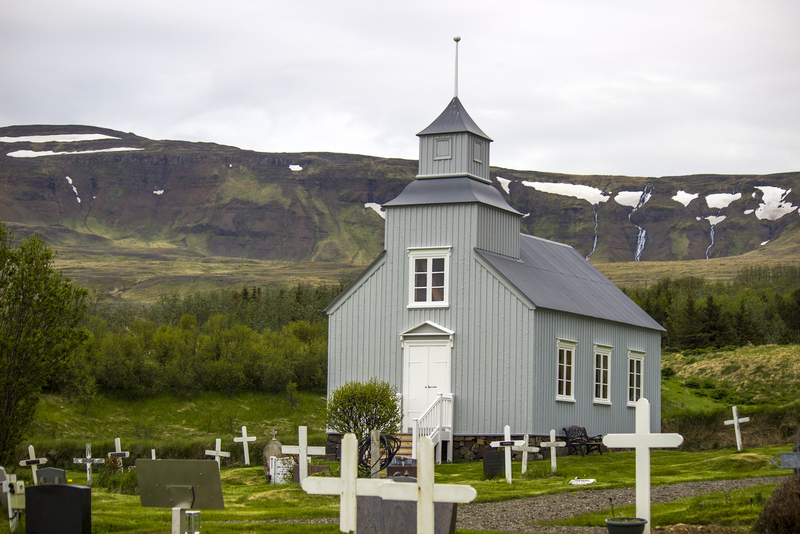 There was lots to see and it was the perfect place to stop between Akureyri and the Westfjords. After we spent the day exploring Hvammstangi and the Vatnsnes peninsula, I decided to take a stroll around the property of the cottages. 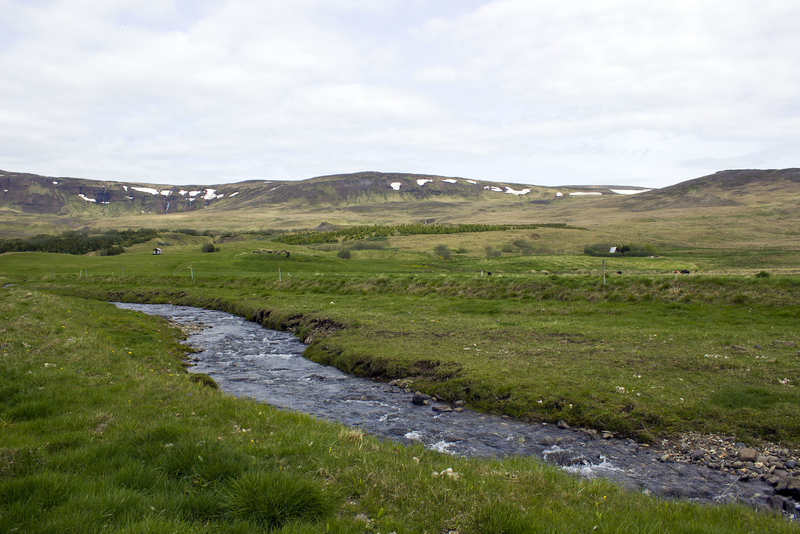 I was captivated by the rolling grassy hills and the small creek that ran alongside our cottage. Walking down the road past the campsite, I stumbled upon a small historic church. Kirkjuhvammskirkja was constructed in 1882, though the oldest reference to a church being in this spot dates back to 1318. The church hasn’t been in use since 1957, and it is now maintained by the national museum. There was also a small wooden bridge and more gorgeous scenery, as always. You can count on that being everywhere you look in Iceland. For more photos of Hvammstangi, please check out our Hvammstangi Iceland travel photo album. 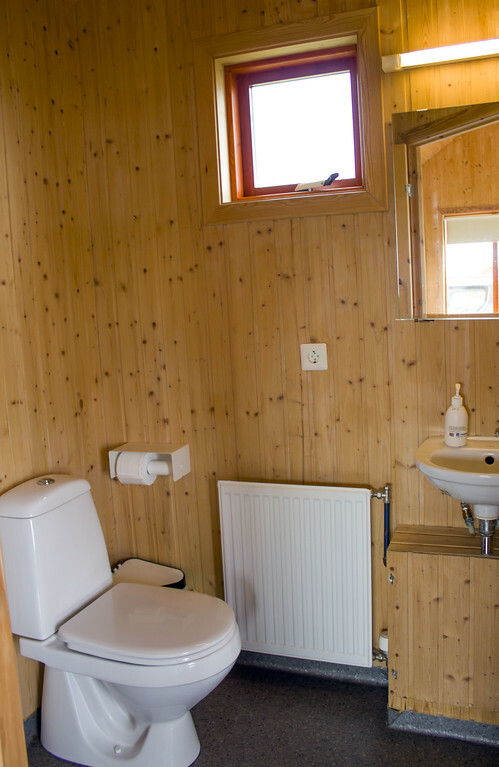 We booked our stay at Hvammstangi Cottages online and it was a self-serve accommodation. This meant that we opened a lock-box to obtain our key, followed the short list of rules of the cottage (clean your dishes and throw away your garbage), and locked up the cabin and the key when we were ready to leave. We didn’t interact with any staff members or anyone during our stay. The cottage was very easy to book and stay overnight at Hvammstangi Cottages. If we had any problems, we could easily get in touch with the owners. Need more Iceland trip planning advice? Check out our Iceland travel page with the entire details of our two weeks in Iceland! 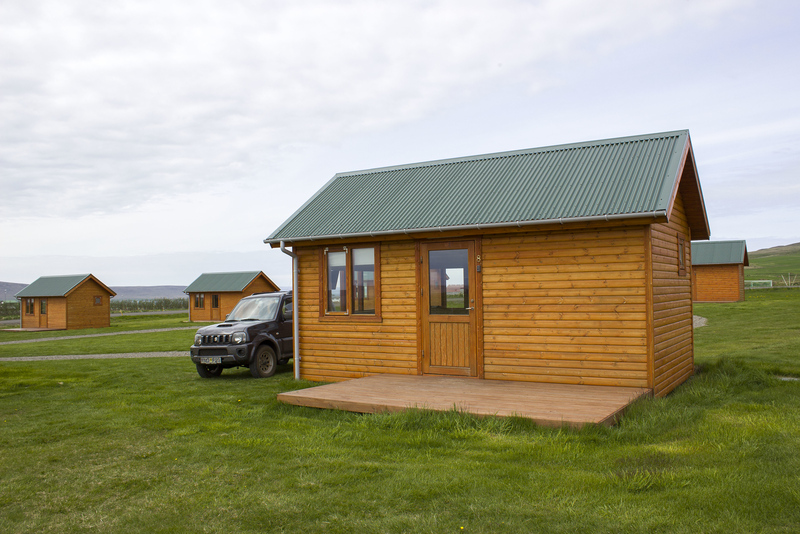 We adored these cabins and highly recommend that you stay here during your visit to northwest Iceland. Even better, spend a day in Hvammstangi searching for seals, and exploring canyons and waterfalls. After an adventurous day, settle down at Hvammstangi Cottages for a restful night. These cottages look great! We did a self-drive tour in Iceland a few summers ago, spending two weeks driving around the N1 route, with some meanders off onto coastal roads instead… love the look of these pretty cottages, nicely furnished too. It looks like a great place to stay. Clean and the kitchenette is a big plus. Restaurants are expensive in Iceland so it is always nice to be able to prepare your own meals. So often we wish there was a simpler place to stay when doing a trip like that. You don’t need something fancy for a quick overnight, and these look like the perfect way to do that. They really have everything you need and they look clean and nice. 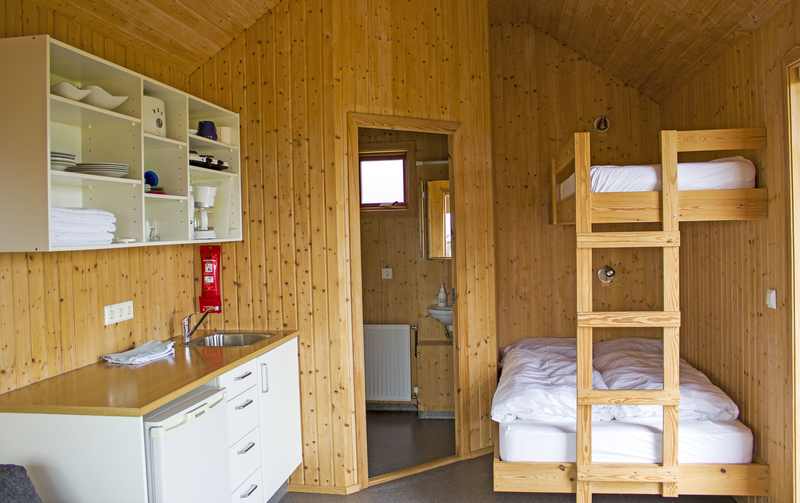 We haven’t made it to Iceland yet, but when we do, I think these adorable cabins will be on our accommodation list. Although, I am not sure we will find the bunk beds as “cute” as you did, but the bottom one looks large enough for two. I am not sure why, but I was surprised it has wifi. This looks like a veery cool and authentic place to stay. I will take some notes here for my visit to Iceland in the future. 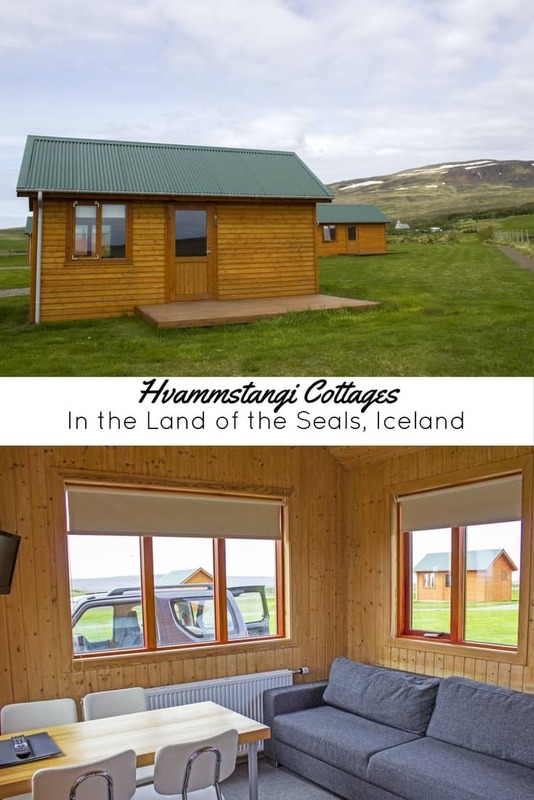 The Hvammstangi cottages look so cute and adorable. The interiors are great and the amenities too look adequate to have a great stay. This is probably a great way to relax and embark on your exploration of the white wonderland of Iceland. Also, I feel the small village would give one an opportunity to get closer to the local life and culture. These cabins look incredible – especially for having WiFi! 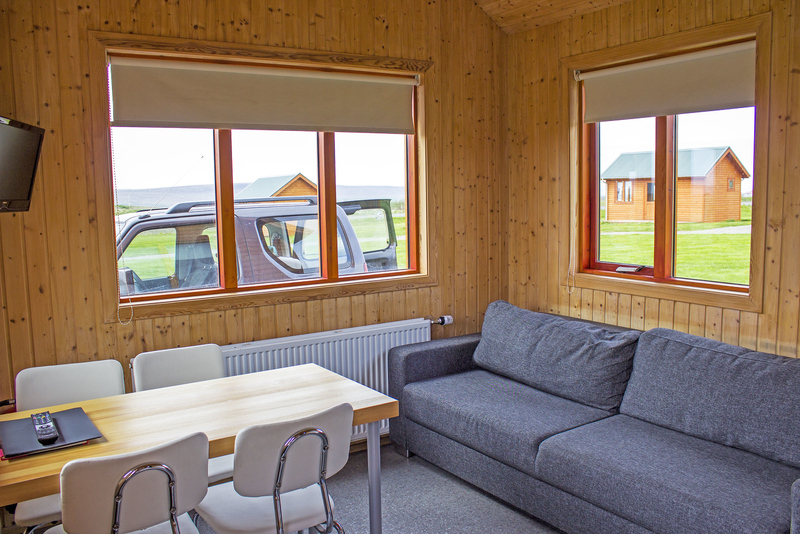 This was the type of accommodation we stayed in on our trip of Iceland too – but we only had 7 days to do the ring road so want to head back again to spend proper time and have the chance to stray a bit from the ring road. Will make a note of Hvammstangi and the cottage stay :) Thanks! Iceland definitely has some pretty cottages. This cottage looks so cosy and cute , would love to plan a stay here. We are planning to do Iceland in September this year. I haven’t been to Iceland but I think I need to plan now since I don’t have to worry about the wifi in those cabins. LOL. Thanks for sharing this.